Posted by Ada Wang on 11/29/2018 11:42:43 AM. Adobe DRM protected ePub books might be the most common format when people buy eBooks from online-stores, except Amazon Kindle. Adobe DRM is the only opened digital right management service provider compared to Kindle DRM, iBooks DRM or Nook DRM. While ePub is an open-source format, a standard of this industry. No doubt they will combine so frequently and perfectly. It's a good news for digital content publishers, but not good for readers. Because publishers can easily create Adobe DRM protected ePub books, then readers get limitations on these books. Therefore, this article is teaching you how to handle this universal problem: remove DRM from Adobe ePub books. To easily and quickly remove DRM from Adobe ePub books, this program is just what you need. By installing this software, you are now just one step away from get a DRM-free ePub book and read it anywhere you want. 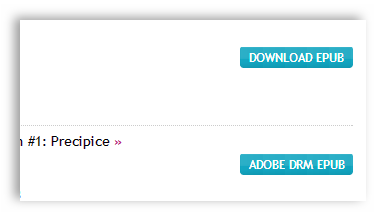 The default input source folder is Adobe Digital Editions content folder "My Digital Editions", but only books downloaded via ADE are saved in this folder. So another issue in decrypting ePub books is to find the books in your local drive and load them into the software. 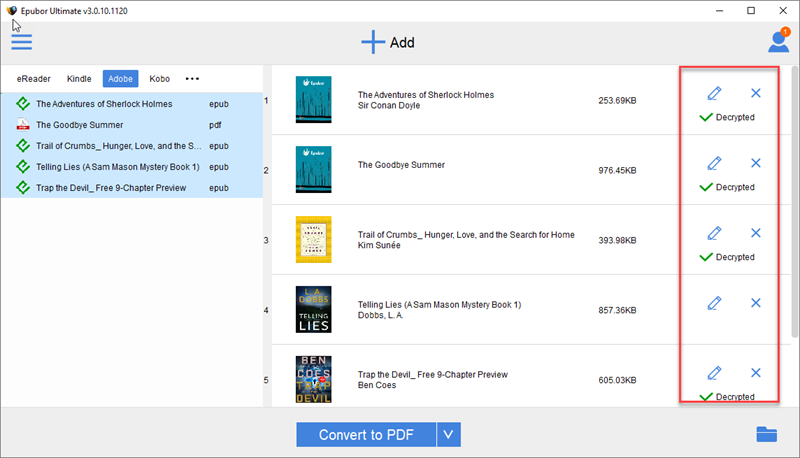 You have 2 ways to get your Sony books onto computer: sync via Sony for PC/Mac, or download .acsm file and convert to ePub with Adobe Digital Editions. If you get your purchased Sony books via Sony for PC, the books are saved in "My Documents\My Books\Reader" for Windows XP, and "Users\[Your Username]\Documents\My Books\Reader" for Windows 7. And for Mac users, books are saved in "User/[Your Username]/Documents/My Books/Reader". If you download a book directly from Sony website, you will get an .acsm file. Please read this article which is telling you how to convert .acsm file to an .ePub eBook. Although Kobo also provides reader software sync and website download methods, but Kobo's reader program for computer has encrypted the ePub books, even if we find the files, it is not a regular ePub and we cannot remove DRM from them. Update: Now we have found a good solution to deal with them (Kobo Kepub books)! For more information read this guide remove drm from Kobo Kepub please. So the only way to get Kobo ePub files is to download from the website. "Download ePub" button means this ePub is DRM-free and you can directly get an .ePub file. "Adobe DRM ePub" button means this book is DRM protected, you can only get the .acsm file. And to download these books from Kobo webpage, just go to your Kobo library. After downloading the .acsm file, this article will tell you how make it turn to .ePub book. Nook books uses 2 kinds of DRM protection, so the Adobe ePub & PDF DRM Removal might be not able to satisfy you in all the cases. For Nook books, we recommend you the All DRM Removal, as it can handle both Adobe DRM and Nook DRM protected ePub and PDF books. To find your Nook books, please install Nook for PC/Mac and download them via it. PC users please find your books in "My Documents\My Barnes & Noble eBooks", Mac users please go to "Users/[Your Username]/Documents/My Barnes & Noble eBooks/[your Nook registration email]". For detailed information, please click here to lean more. je travaille sur MAC 0S est possible??? what a super great program! so easy, can't belive it. I have never left a comment anywhere, but this calls for some cred! The TXT file just save 20% of ebook content. I have the trial edition and its decrypts my book but then I can't open it. I get the message: Adobe Acrobat Reader could not open 'book1_2018_nodrm.pdf' because it is either not a supported file type or because the file has been damaged (for example, it was sent as an email attachment and wasn't correctly decoded). What am I doing wrong?